If you are looking for a high quality still inexpensive dSLR to begin your professional shooting experience, here is the guide you need to get the best dSLR under 500. The Pentax K200D was the replacement for the K100D Super, which itself was an update to the K100D. The K200D entered the market as an all new entry level camera in its segment. 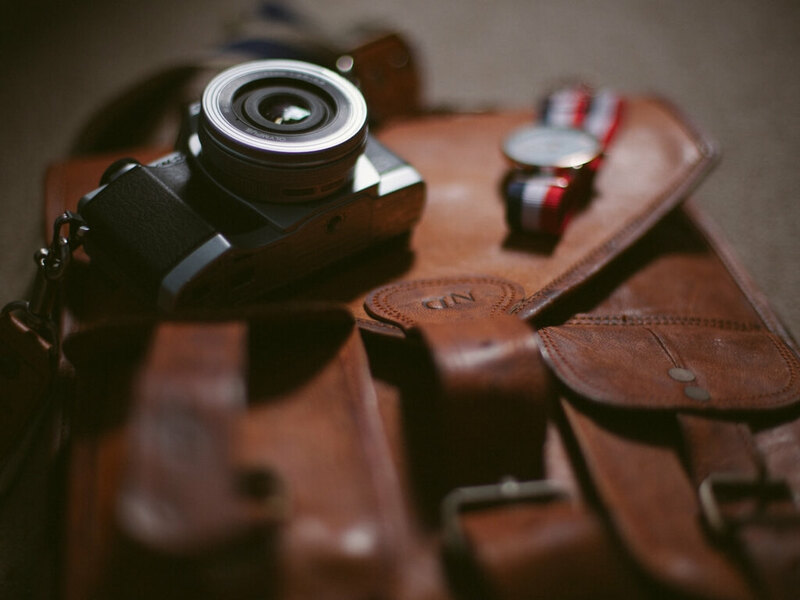 The camera will be competing with the likes of the Olympus E-520, the Canon EOS 450D, and Nikon D60. The good thing about the Pentax K200D is that despite an attractive price, the camera doesn’t compromise on features at all. The camera comes with a CCD-shift type ‘Shake Reduction’ system, Pentax’ 11-point Safox VIII AF system and Dust Removal. The camera also sports a weather-sealed body, which is pretty unusual for the camera of its class. In addition to this, there also is a magnification of 0.85 and a comparatively bigger viewfinder having 96% coverage. But what you won’t get here in this camera is a live view system. About the design of the Pentax K200D, we would like to say that it was more of a revolution than evolution. The design of K200D has a lot of softer and rounder shapes that we firstly saw on the K100D and the K10D. But this time, they’ve been even more smoothed and have been refined. Aforementioned makes the camera an immensely comfortable camera to hold and operate. The build quality of the camera is superb. The body of the K200D is also made up of re-enforced ABS plastic just as its precursor. Under the hull, though, you’ll find a stainless steel chassis. One another unique feature that we found was the fact that the K200D is dust and splash-proof camera. Lastly, we would like to say that the Pentax K200D is just perfect for developing the dSLR users, offering an easy-to-use interface and incorporating the highly acclaimed PENTAX imaging technology. The dSLR has 10.2 Megapixels. The Pentax K20D has plenty of advanced features including an LCD monitor, the Expanded Dynamic Range function, and Custom Image functions for perfectly controlling the development of the images. 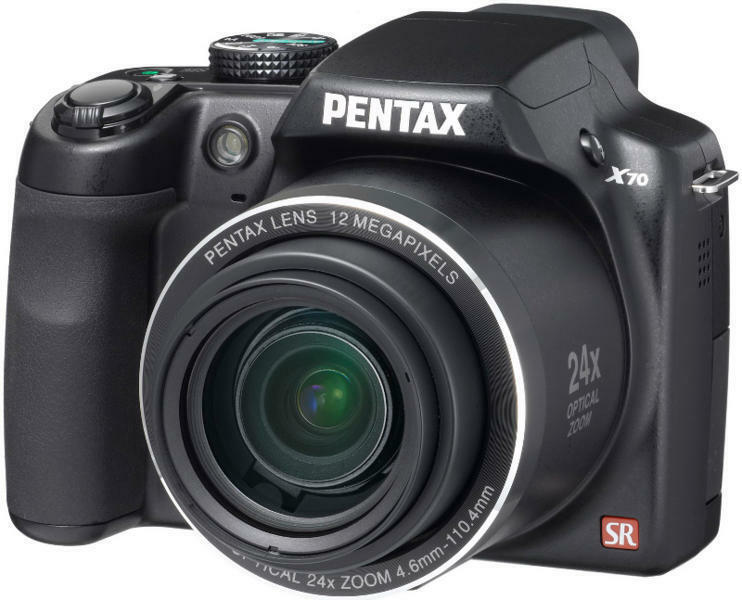 So if you are looking for a decent dSLR camera, then the Pentax K200D will satisfy all your photography needs. We’ll be honest with you and say that we liked the Panasonic Lumix DMC-GF3 pretty much. It’s a camera which boasts shooting speed and photo quality, along with a user interface which is familiar to the users. But when the camera entered the market, we heard a lot of buyers upset about it as they were looking for an actual heir in the GF series. The eager customers were bothered by the slightly bigger size of the camera in replace of a hot shoe and physical mode dial. Well, it seems as if Panasonic heard all those peevishness as well or maybe this was always their primary plan. Whatever is the case, the Panasonic Lumix DMC-GX1 Micro 4 Thirds-based camera is the heir to GF1, which technically GF2 should be. Also, it brings back the improved design for the camera with enhanced shooting design. Most importantly it brings back the physical mode dial, which was omitted with the Panasonic GF2. The Panasonic Lumix DMC-GX1, in fact, is bigger, deeper and longer than the GF3. But its depth could be attributed to the comparatively larger grip. Also, to all that the Lumix DMC-GX1 sees, the significant enhancement in photo quality and performance as oppose to its precursor. We liked the overall design of Panasonic Lumix DMC-GX1, but we still have our set of issues with it. The Lumix DMC-GX1 is bigger than all the other cameras of its league. But none of its rivals are adequately small with a lens attached. The camera clearly has a respectably-sized thumb rest and grip, which makes holding the camera comfortable. It also allows single-handed shooting and feels well built. The Lumix DMC-GX1 has a flash pretty much like what we saw in GF3. You could even hold that tilted slightly back for allowing the light to bounce. It’s a beautiful move. Also, the hot shoe of the camera also functions as a position for an optional electronic viewfinder. Apart from this, the rest of the control layout for the camera is pretty standard. The mode dial on the camera comprises the regular set of PASM modes. There are also two slots for four custom setting groups, sight modes, and rather uninspiring Creative Control individual-effects modes of Panasonic. 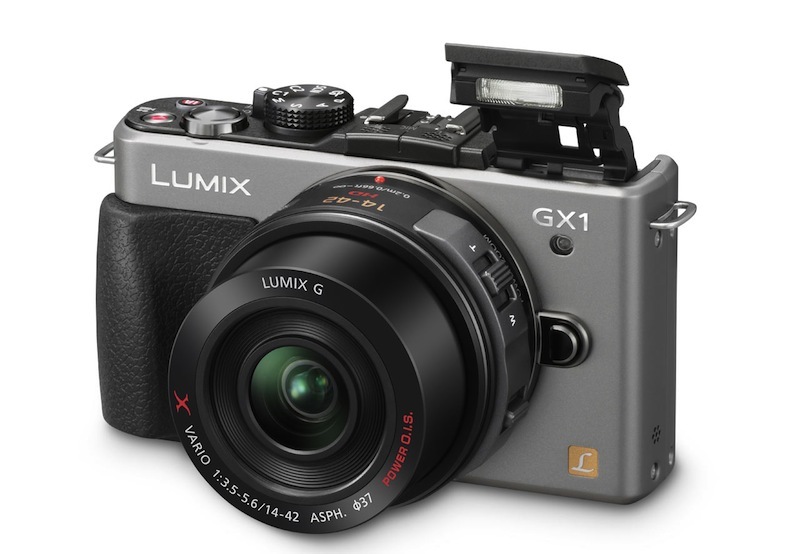 The Lumix DMC-GX1 also boasts an iA intelligent automatic override switch for rapidly entering and exiting the automatic mode, a Panasonic-explicit execution we like, and a video record switch. The Panasonic Lumix DMC-GX1 delivers the best photo quality from Panasonic to date. Even the noise profile of the pictures could match the NEX-5N. The JPEG images can be shot up to ISO 400 in decent lightening conditions without any significant degradation in details. That said, even the images shot at ISO 200 have some extent of softness. You could still see a bit of noise in darker regions even at their lowest sensitivity of about ISO 160. But the raw mode appears pretty decent even at ISO 800. The video shot from the DMC-GX1 also came pretty clear, and the 1080/30p MP4 option for the camera we think is the pretty nice option to interlaced AVCHD. We were shocked for not including the AVCHD 2.0 though. The videos were pleasingly sharp and nicely saturated. The Panasonic Lumix DMC-GX1 is a nicely designed camera with a user interface, which we think will excite the innovative photographers who are on a tight budget. Like most of the first attempts, the Pentax X70 is also an active effort by Pantech towards creating a Megazoom camera. But, again like most of the first attempts, this too has its limitations. It also suffers from most of the common problems that we’ve seen in most of the cameras in its category, namely a noticeable decline in photo quality over ISO 200 and slow performance. The Pentax X70 comes with a broad range of shooting options ( from completely auto to completely manual ), and the 26mm-equivalent wide-angle lens of X70 has 24x optical zoom, which is pretty flexible and fun. But there are still some of the feature slip-ups and, once more, the poor photo quality and performance stops it from being a complete success. The Pentax X70 is comparatively lighter than most of the other cameras having zoom range equal to this camera. Moreover, the X70 looks like a decent Megazoom camera and feels relatively high-quality. Well, except the lens, which sort of floats loosely in the barrel. Overall, the camera feels great with a great rubberized handgrip on the right and likewise textured thumb rest on the rear end of the camera. The camera has an eyepiece for its electronic viewfinder sticks out over the 2.7 inch LCD, and luckily it has a button that will take you forth and back in between the two. Most of the controls and buttons of the camera are neatly labeled, including the Mode dial positioned on the top. The menu system for the camera is also pretty straightforward and rather easy to navigate as well. Instead of going for the conventional AA batteries that most of the Megazooms use, the Pentax has powered X70 with its rechargeable lithium-ion pack. But since it’s a tiny one, the camera struggles on the battery front. 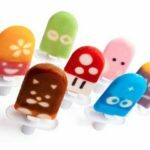 It’s better that you take an alternative power source with you if you are going out for a long time. The camera will be a real treat for the users looking to supplement a digital SLR or the users who want a broad range of shooting options. The camera comes with entirely manual and semi-manual modes, which provides you finer control or lets you room for experimentation. There also is a User mode that allows you to define a frequently used group of settings. The X70 comes with Auto Picture (automatic scene recognition), Scene and Program modes, which enables you to do the heavy lifting. Pentax has also provided X70 with its dedicated Green mode button, which allows you to straight into basic automatic shooting with limited access to shooting options. One major disappointment here is the absence of full-resolution endless shooting mode. We even would have appreciated a little three-shot burst. Instead, the Pentax X70 comes with three levels of high-speed, nonstop shooting at a 5-megapixel resolution. The fastest of the three is capable of capturing 21 photos at an average of 12fps. 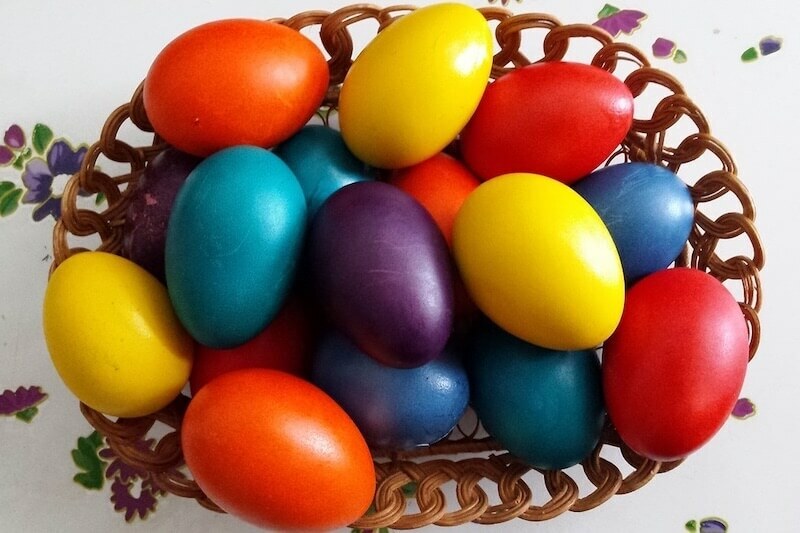 Performance has never been the strong point for Megazoom cameras of this quality, and same is the case here as well. Just because the Pentax X70 has the looks, feel and shooting options similar to other dSLRs, it doesn’t mean that it also will performance like dSLRs. Overall the X70 is pokey and takes 3.1 seconds to start up and capture its first shot. The shutter lag for the camera in bright conditions is around 0.7 seconds while the same for low-light shooting becomes 1.4 seconds. The camera takes 2.9 seconds to capture two consecutive shots without flash while turning on the takes that time to 3.1 seconds. But if you are shooting flowers, landscapes, rocks, slow-moving animals, and sleeping and immobile people, you don’t have to worry about these things. The photo quality, on the other hand, is notable good for a Megazoom camera, but it remains like a point-and-shoot. The Noise becomes apparent right from the start at ISO 50 if you view the photos at full size, though if you are looking them in small size, it won’t become noticeable until ISO 200. The colors of the pictures were inaccurate but were pleasing at the same time. The Pentax X70 could have been a triumphant Megazoom if the image quality and the slow performance had been better. The Compact System Camera market is the latest and the fastest booming market in the digital world, and almost every manufacturer has made their presence felt with their camera. The latest and probably the most recent entrant in that market is Nikon. But before we move any further it’s important to let you now what exactly a CSC camera is. The CCS camera is no exceptional camera; it’s just a regular compact camera with the lens swapping ability like SLR digital cameras. 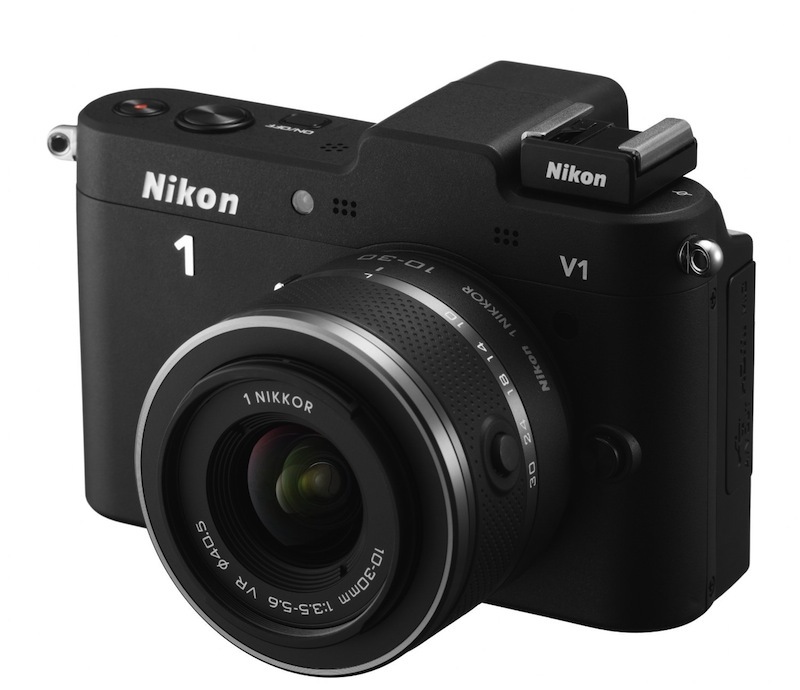 We’ve already seen such cameras from Panasonic, Olympus, Samsung, Pentax and Sony, and now we have the Nikon V1. The recently launched Nikon V1 that we’re reviewing here is company’s flagship model in the new CSC market. This is the reason Nikon has christened ‘1’. Nikon also recently launched budget J1 model. While the J1 is primarily for the budget consumers, the expensive V1 targets the photo fanatics with its almost realistic looks. The V1 is in lusterless black or immensely shiny white body colors. The closest rivals for the Nikon V1 is the Sony’s new-fangled NEX-7. Just like the V1, it is the only compact system camera having an en suite EVF (electronic viewfinder) on top of the standard backplate LCD. According to Nikon, the V1 at present is the smallest interchangeable lens camera in the world to have an EVF that offers incredibly high 1440 k-dot resolution here. The tiny size of the camera has its restrictions and the biggest here being the tiny image sensor. Let’s have a closer look at the camera and find out what the Nikon V1 has in store for us. To everyone’s surprise, the Nikon V1 felt rather firm in hand, courtesy of its magnesium alloy rear and front paneling. It is the same material that is being used for manufacturing semi-pro dSLRs. So as far as the build quality is concerned the V1 is the closest rival of Olympus E-P3 Pen, which also had a rugged build and felt pretty much like a ‘toughened’ model. The lustrous white finish of our review unit increases the public visibility of the camera. 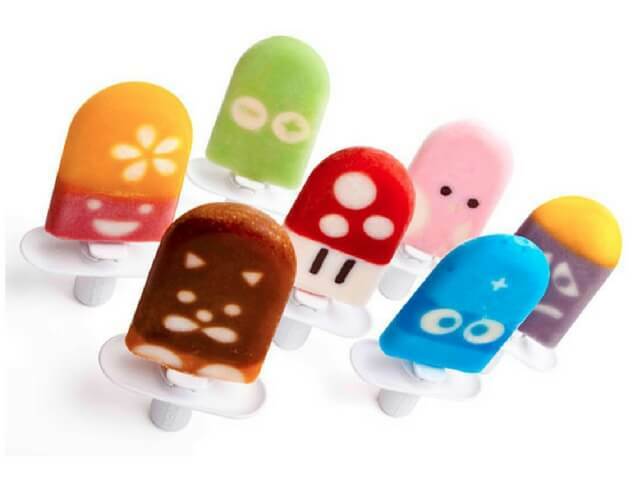 At the same time, this makes it rather slippery and tough to use with ease. There is a tiny and thin bump on the front to put your fingers while there is a rubberized pad on the rear end of the camera for the thumb. The Nikon V1 boasts multi accessory port like Panasonic and Olympus CSC models, and it is on the left side of the EVF. It allows you to expand the setup of the camera when you are viewing the camera from a rear side. 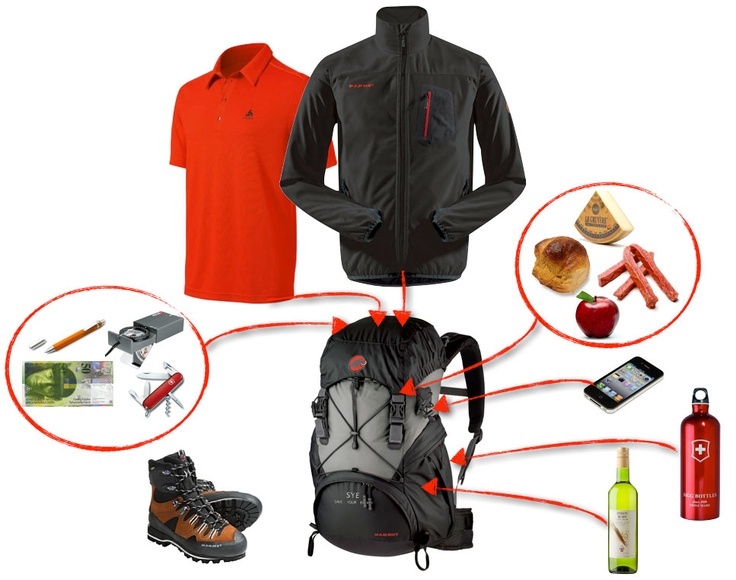 You could easily accommodate GPS unit and external microphone. It should be noted that the Nikon V1 doesn’t slot in a flash unlike the Nikon J1, which means this will be your first extra purchase. In addition to this, the rest of the operational controls for the camera are rather simple and straightforward. The most critical of the top plate controls is the shutter release, sandwiched between video record and separate off/on buttons. Positioned at the rear end is the shooting mode dial which only has four settings: still image, movie, Motion Snapshot and Smart Photo Selector. Some other controls at the rear end of the camera are the pretty conventional set of buttons. These include the display, playback, delete and menu buttons, the scroll wheel and a multi-directional command pad to change and select options. The Nikon V1 boasts a rather standard 3-in display screen having an aspect ratio of 4:3. But the real thing here is that with its rather efficient resolution of 920k pixels, the screen here matches the competitors. In fact, that is twice most of the rivals have. The display here is LCD as oppose to the convincing, OLED high contrast screens that we saw in Samsung NX200 and Olympus E-P3. But the thing here is that the screen is apparently clear, and there isn’t any impression of the display being second best humanly. The menu layout here appears surprisingly basic regarding design for a dedicated model. But still, we didn’t find ourselves hunting for the options that we want to use. As a matter of fact, the options here kept on increasing or decreasing according to the shooting mode that we selected. Though, a Quick Menu one-touch option we’ve seen in Panasonic Lumix opponents, whereby the necessary settings like the ISO light sensitivity and picture quality are being coupled together in a toolbar to view at a glance. About the performance, we’d say that the Nikon V1 was pretty much a point and shoot camera with not one but two focus systems. Having the intrinsic capability to cut ‘n’ vary among a 73-point phase finding AF system in case of a moving object or glossy surfaced, or a contrast detects 135-point AF system in case of poor lighting conditions or when the object isn’t moving. Obviously, with most of the consumer dSLR cameras offering “average” 9-point AF systems, the Nikon was successful in attaining the most number of AF points with their Nikon V1. The overall performance of the Nikon V1 was pretty satisfactory, be it video or still photography. The Nikon V1 is powered by a massive EN-EL15 7.0v battery. The battery holder is on the base of the camera. There is also a slot for optional SDHC, SDXC or SD card. According to Nikon, the V1 has the battery life of decent 400 shots at max or 2 hrs of constant HD recording. So even the battery life here is pretty impressive. With its rugged build quality, incorporation of some high-end features, impressive performance and decent battery life, we think that the Nikon V1 is a decent CSC from Nikon and will fulfill the expectations of the photography fanatics. Apart from the fact that Pentax K-x comes in a wide assortment of color options, there is a lot of things to like about it. To have an entry-priced dSLR with so many stylish features are something that you don’t typically see in this class. Taking forward the tradition of assertively priced dSLR’s, the Pentax K-x model shatters the small barrier to bringing video capture support in a kit which is less than $500. The K-x also is fast with the great Photo quality and an impressive noise profile. And despite the fact that certain things disenchanted us, we would say that many of the shooters definitely will appreciate the K-x for being a budget dSLR which delivers exceptional performance. The viewfinder inherited from its predecessor is one of the highlights as well as an annoyance of this camera. From the advantage point of view, this viewer provides a little enhanced coverage and additional intensification than some of the other consumer models. But on the other hand, it doesn’t display the autofocus areas which can be annoying in a bewildering move. There is the signature green button of the camera to choose the image settings, reset the camera, apply an effects filter, show a depth-of-field preview in the viewfinder, and to reset the autofocus point at center or override the file format settings. We liked the file override capabilities of Pentax. In most of our performance tests, Pentax K-x is extremely fast. It can easily take 0.7 seconds to start and shoot; now it could be little slow but certainly isn’t bad at all. The shoot and focus time in decent light is a quick 0.3 second and increases to 0.5 seconds in low light. But for all the other performance tests the Pentax K-x for no reason was poor. Most noticeable was its image stabilization. Though the videos taken from Pentax K-x was of so-so quality, it is capable of taking superb quality pictures, and this is what impressed us the most. 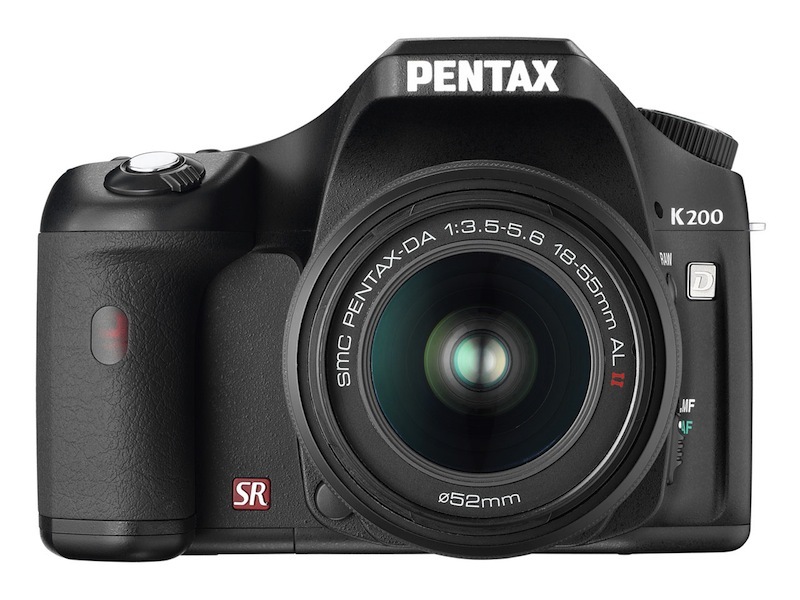 So as long as you are ready to bear some of its quirks, the Pentax K-x will stand tall on your dSLR expectations and will deliver excellent quality pictures with little noise. 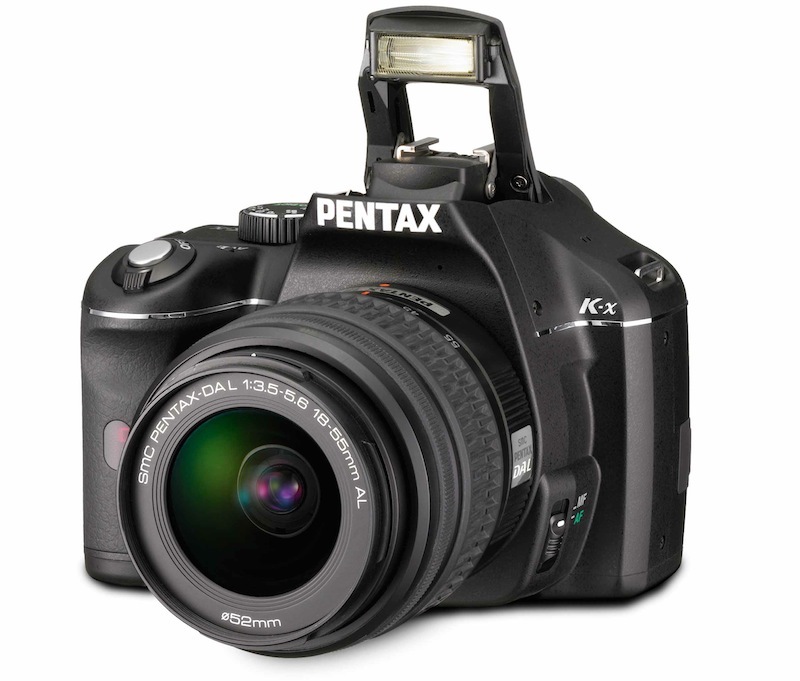 Pentax K-x is a much better-than-average inexpensive and fast dSLR with low-light quality. But it also has its set of flaws, such as the defective image stabilization. The Nikon D5100 entered the market as an alternative and rival from Nikon; substitution for the Nikon’s two-year-old D5000 and rival to Canon’s EOS Rebel T3i. We have to say that although this is the first time Canon and Nikon are going head-to-head regarding their product launch timing and updates in technology, both the manufacturers are doing exceedingly well. 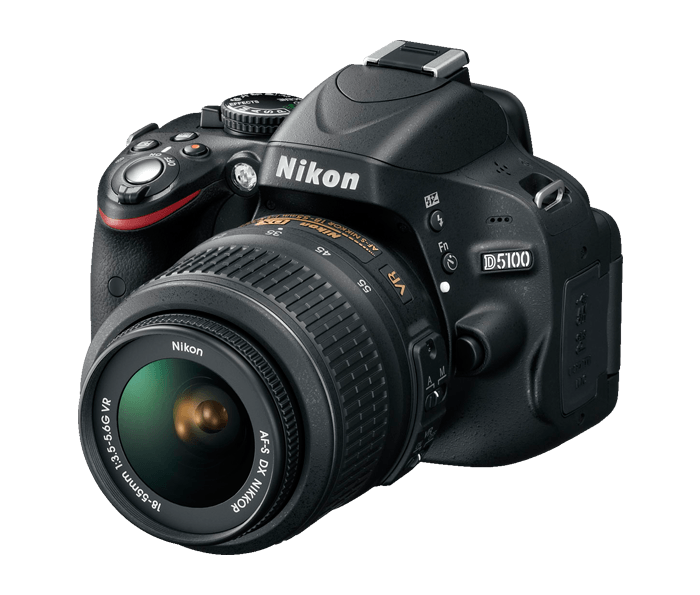 The Nikon D5100 entered the market with as a complete replacement of D5000 in almost every aspect. But the D5100 differentiates itself nicely from being an unnerving sub-$500 dSLR. The image quality offered by the Nikon D5100 is better than the D5000 on all ISO sensitivities. We have to say that the D5000 was better when it comes to white balance. The camera also has an excellent JPEG noise profile, and remains rather clean up to ISO 400 and, remains rather usable up to ISO 1600, except for few complete degradation from color noise. After that, the quality mostly depends on the content of your scene, but we wouldn’t recommend ISO 6400 or higher. There also is a lot more color noise in the high ISO JPEGs than what I’d like. There still is sufficient detail, tonality and color saturation that makes photos immensely usable. So in general, the Nikon D5100 is a worthy replacement and a real rival for the respective cameras. Just as many of the cameras of its price bracket, the Nikon D5100 feels plasticky but solid. The overall design of the camera has many changes. One of the most apparent changes in the camera includes the most prominent slope built on the left shoulder of the camera, although we don’t like the slope too much and think that it will make the camera look lopsided. The good news is that it does not affect the shooting experience from the camera. One of the most impressive updates for the camera is its bigger and higher-resolution display. Nikon also has worked and changed the movement of the spoken LCD to a more conventional flip-out-and-twist from a drop-down-and-twist. Sadly, we found the display of the camera too contrasty, which sometimes even made us think as if our exposures are off. Also, it’s hard to have a look at the screen despite changing the angle. Similarly, the viewfinder of the camera seems like most of the low-end models: dim and having small autofocus points, which are immensely difficult to see without lighting them up with the help of pre-focus. Although there are bigger AF area markers and, in general, we like the camera more than the Canon. The controls on the rear end of the camera are laid in a typical manner. The information edit button on the camera is different from the info button. It’s on top of the camera for adjusting the shooting settings. The only problem with the camera is the navigation switch which you can’t lock. The performance for all the cameras of this class is sufficient to handle the typical consumer shooting. Though the Nikon D5100 that we are covering here comes on the lower end of a comparatively fast group. The camera powers on and shoots in just around 0.3 seconds. The average time for focusing and shooting for the camera is of 0.3 secs, and 0.6 secs under weak or dim lighting conditions. So overall the performance of the camera was slower than what we expected. The best thing here is that the camera might be on the slower side. But it delivered excellent photo quality, and the overall picture quality of the camera is impressive. The Nikon D5100 offers superb photo quality along with an excellent noise profile, a smooth shooting design for both video and photo, and a broad, sensible feature set which enhances the strengths of Nikon D5100. Surely the best dSLR under 500 on this list along with Olympus E-P3. The Olympus e420 or the Olympus Evolt E-420 is a 10 Megapixel dSLR. It was launched on the market with two primary goals. It should be the first and one of the most compact dSLR’s available on the market.. Secondly, the camera should be appealing enough for the newbies that are stepping up from a snapshot camera in the market. But results for both those goals of the e410 are mixed up. We don’t have many complaints about the design of Olympus e420. As a matter of fact, we were happy to see the slim profile of the camera though the body is grip-less. The camera weighs a diffident 1 lbs, 4.2-ounce along with the 28mm-to-84mm-equivalent lens. We have to say that the camera feels immensely solid in the hand and don’t feel at all like a budget model. Both the kit lenses of the camera are compact and lightweight. We, at first, thought that the flat grip of the camera would be a bit ill at ease. But if you hold the camera with two hands, it remains comfortable. Though, we understand that for certain tasks, a bigger grip makes a huge difference. For instance, when you are trying to adjust the white balance manually, with a white card. The control layout and the menu interface for the camera resemble with most of the entry-level dSLRs, having a dial mode split between manual, scene, and semi-manual exposure modes. The Scene selection offers snapshots-like thumbnails and descriptions among all the available scene modes. The menu layout and structure for Olympus e420 significantly differs from current snapshot cameras provided by Olympus. So newbies shouldn’t expect any learning curve shortcuts there. 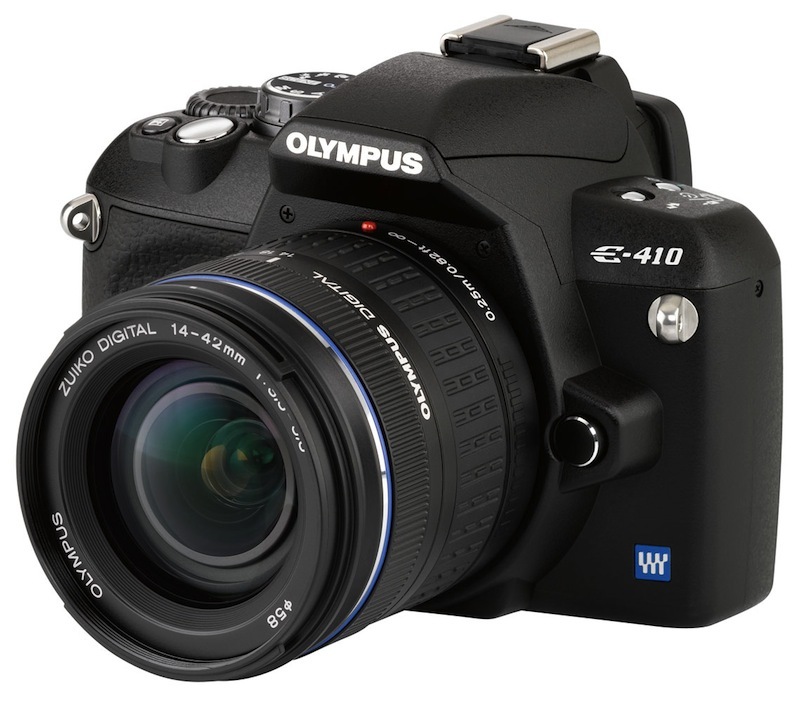 On the whole, the Olympus e420 is capable of delivering great photos. It’s what separates the camera from its rivals such as the Canon EOS Rebel XTi and Nikon D40x. 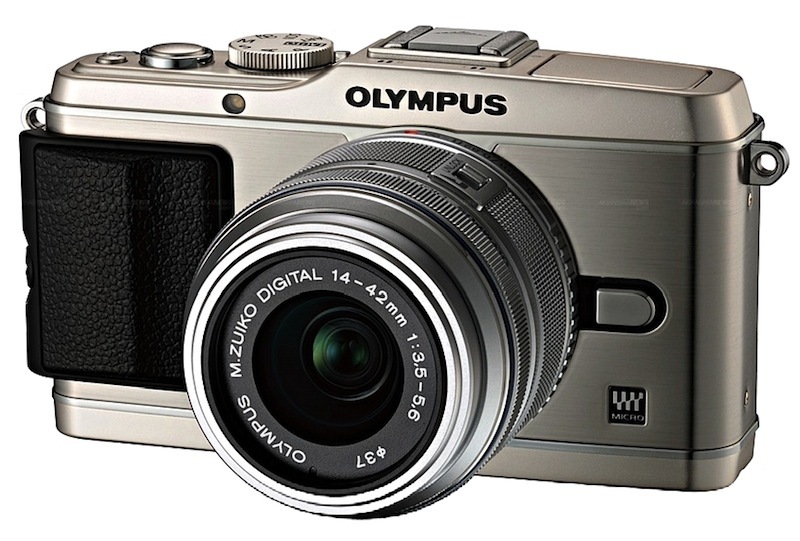 But the overall performance of the Olympus e420 delivers mixed performance. The camera is immensely fast with wake-up and shoot time of 1.4 seconds, high-contrast response timing of 0.4 seconds, along with a 0.7 second time for shot-to-shot for raw and JPEG both, under the same conditions. The same timing raised to a sensible 0.9 second for poorly lit subjects. 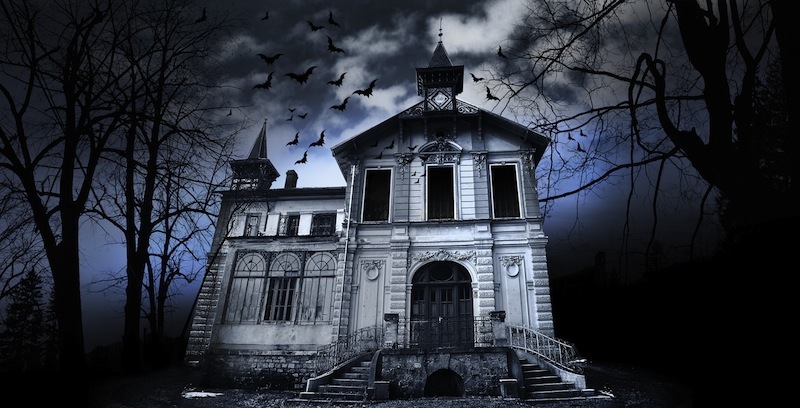 If you turn on the flash to improve the exposure, the timing comes down to 0.7 seconds. The camera can also maintain a 3.3fps clip in its constant-shooting mode, in spite of its resolution, for around 15 or so frames. So the performance bag of the Olympus e420 has mixed results. The Olympus e420 surely is an excellent choice if you are looking for a camera which is perfect for anyone who wants to save a bit of money and space in their bag. But certain issues with its white balance and automatic exposure make it an unacceptable option for anyone looking for their first dSLR. The Olympus E-P3 is quite a different entry model in the modern market. The simple reason for that being the fact that we thought this type of cameras isn’t being manufactured anymore. The Olympus E-P3 flaunts a retro design and metal construction, which makes it clear that the camera has been made to last. Although the camera resembles with a compact camera, the lens on the front could be swapped like on the bigger SLR models. All this combined with a better electronics than what we’ve seen on most of the compact models, makes sure that the camera delivers high-definition video recordings and improved quality pictures in the uppermost resolution, 1080p. The most significant improvement over the previous Olympus E-P2 is a turn-up flash, which settles down on the top plate when it’s not in use. The grip now can be removed, though we prefer to keep it on. The screen here is touch-sensitive, but it still has sufficient buttons. It’s nice because we avoided using the touchscreen and preferred the physical buttons. Our review Olympus E-P3 came with a 14 – 42mm Olympus lens equal to 28 – 84mm on an older film camera. It was rather quieter than the previous model, which has been criticized for noise. The camera can use ‘micro 4-thirds’ lens system from any maker. In general, the expensive cameras are rather complicated. Thankfully that was not the case here, and the E-P3 was rather easy to use. For example, the Intelligent Auto mode of the camera includes ‘Live Guide.’ It allows complex alterations such as blurring a background but keeping a subject sharp. We just dragged the on-screen slider unless we got the picture as we wanted. The one surprise that we had in the Olympus E-P3 is the 12.3 MP resolution. These were in the 2010 range of Olympus. The current rivals from Panasonic and Sony have moved up to 16 MP. It’s nice to see that the Olympus E-P3 delivers plenty of details. The features that we used most in the Olympus E-P3 included the ‘Art Filters’ digital effects, counting a fun mode, which made everything appear pretty small or just as pop art. All these come from the E-P2. But in the new E-P3, the camera has around ten options as opposed to eight. Finally, although the Olympus E-P3 looks pretty much like a blast from the past, it’s an all new camera. It is a lot faster and responsive than the previous versions. The Olympus E-P3 delivers clear and sharp images, and the only problem we have here is the price. But even that, we think it is worth paying because the camera delivers impressive quality and convenience.